Traveling to other star systems is a big dream, but achieving it may require going ultrasmall. Blasting tiny, wafer like sailing spacecraft with powerful lasers could slash interstellar flight times from thousands of years to mere decades, one researcher says. Human excursions to the stars are cursed by math. To get there in any reasonable amount of time, spacecraft must go incredibly fast — but fast travel requires carrying more propellant. That required amount of propellant, whether rocket fuel, a source for nuclear fusion or even antimatter, would make it more and more difficult for the ship to accelerate. Some researchers have found a loophole in this dilemma by imagining a solar, laser or microwave sail. An interstellar craft that surfed on the sun’s photons or on a beam shot from Earth orbit wouldn’t have to carry a propulsion source with it. But to propel a large probe, humanity would need an extraordinarily large orbiting laser, and possibly a sail the size of Texas. Philip Lubin, a researcher at the University of California, Santa Barbara’s Experimental Cosmology Group, hopes to get around such problems with tiny waferlike spacecraft. His idea is one of 15 that won a Phase 1 grant from NASA’s Innovative Advanced Concepts (NIAC) program in May. While manned interstellar flight might not be possible for a long time, Lubin doesn’t see why that should stop us from sending robotic emissaries to the stars. NIAC Phase I grants are comparatively small — up to $100,000 — and they encourage researchers to build detailed plans of attack for ambitious, potentially transformative space travel technologies. Lubin’s concept is a “Roadmap to the Stars” detailing step-by-step development and testing of the tiny, laser-propelled probes. The probes, each weighing a single gram, would ride on a laser beam shot from orbit around Earth and would carry tiny sensors to take measurements and transmitters to report back what they found. The system could be built up gradually, because even slightly larger probes or weaker laser beams would be useful for exploring nearer targets within the solar system, Lubin said. Lubin said that there has been dramatic improvement in directed-energy technology, especially by the United States’ Defense Advanced Research Projects Agency (DARPA). 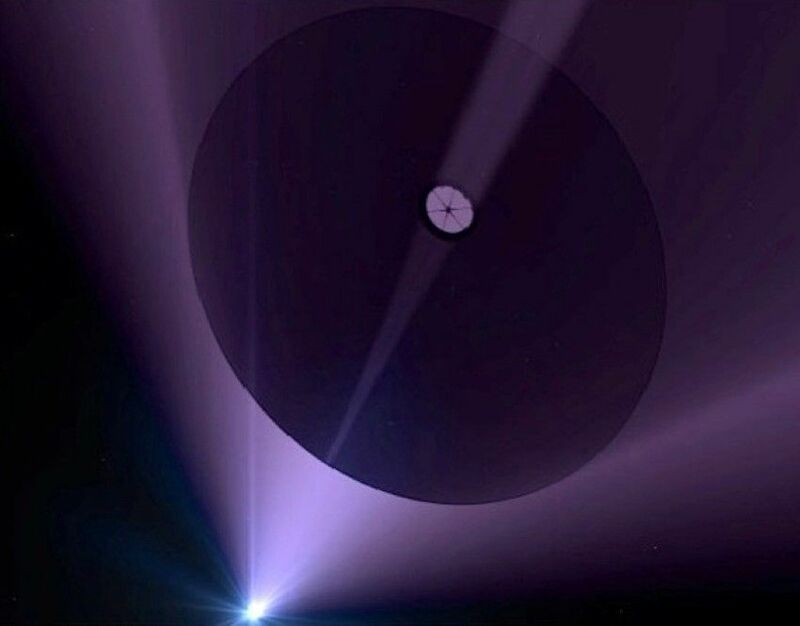 Propulsion that would have once required one prohibitively giant laser can now be generated by a much smaller source tied to many amplifiers in orbit around Earth, which could provide enough power to propel a meters-long sail pulling a little probe. A full-sized laser array would be about 6 miles (10 km) across, but it would be scaled up over time from smaller, usable components. Lubin described the laser setup in earlier research that proposed using the lasers to heat up and knock incoming asteroids off course. Once small versions of this system are established, in ground-based tests and otherwise, they’d begin to scale up. The largest-scale laser system would employ 50 to 70 gigawatts of power to propel the craft forward, about as much as is used to launch current spacecraft to Earth orbit. That laser setup, which Lubin described in a proposal paper, could propel a tiny spacecraft with a 3.3-foot (1 meter) sail up to 26 percent the speed of light in 10 minutes. Such a craft could reach Mars in 30 minutes, catch up with Voyager 1 — humanity’s farthest spacecraft from Earth — in less than three days and hit the star system Alpha Centauri in 15 years. Larger craft would take longer to accelerate but would still vastly outpace our current options, Lubin said. Marc Millis, a propulsion physicist and the founder and director of the Tau Zero Foundation, a group working to advance interstellar flight research, told Space.com that to eventually find an approach that’s feasible, incremental research like this, on a variety of different interstellar exploration strategies, is essential. To make the system work, researchers will have to determine how to focus the laser beams precisely enough to direct the tiny spacecraft — as well as how spacecraft that small will be able to transmit back to Earth. It would also require constructing a large orbiting laser, which would become cost-effective after several launches. Johnson also sees Lubin’s road map as an incremental step to interstellar travel that makes a lot of sense.